SoM-9G20M ARM System on Module | EMAC Inc. Designed and manufactured in the USA the SoM-9G20M is an ARM System-on-Module (SOM) based on the Atmel ARM9 AT91SAM9G20 processor. This ARM9 core processor has an Ethernet MAC built-in along with 7 serial ports. It utilizes external SDRAM and includes an MMU which allows it to run Linux and WinCE Operating Systems. A SoM (System on Module) is a small embedded module that contains the core of a microprocessor system. Using the same small SODIMM form-factor utilized by other EMAC SoM modules, the SoM-9G20 is the ideal processor engine for your next design. All of the ARM processor core functionality is included on this tiny board including: Flash, Memory, Serial Ports, Ethernet, I2S Audio, PWMs, Timer/Counters, A/D, digital I/O lines, Clock/Calendar, and more. The SoM-9G20M is designed to plug into a carrier board that contains all the connectors and any custom I/O required for the application. 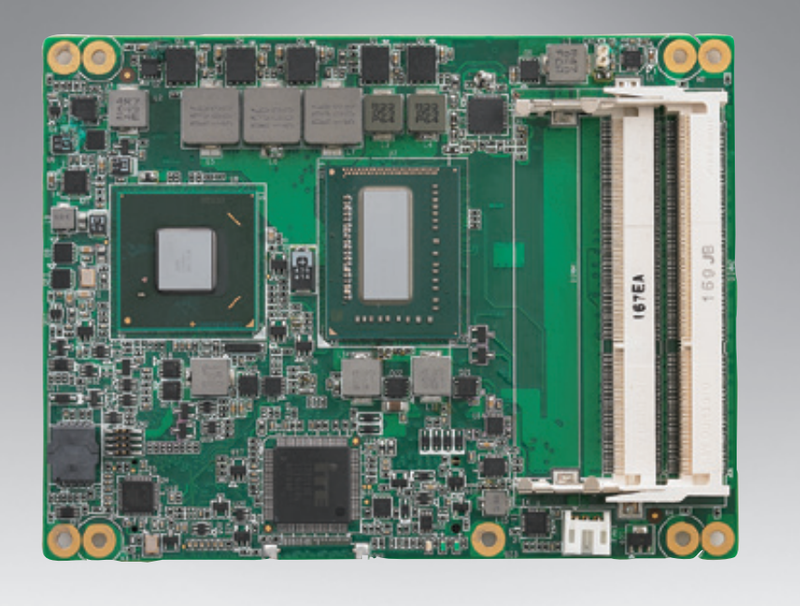 This approach allows the customer or EMAC to design a Custom Carrier Board, that meets the customer's I/O, dimensional, and connector requirements without having to worry about the processor, memory, and standard I/O functionality. With this System on Module approach, a semi-custom hardware platform can be developed in as little as a month. 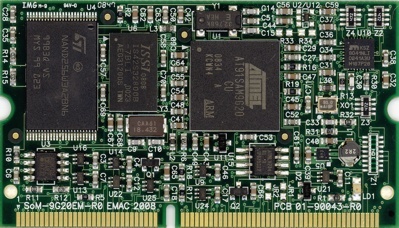 In addition to the option of the developing a Carrier board, one can be purchased off-the-shelf from EMAC. EMAC provides off-the-shelf Carrier boards that feature A/D, D/A, MMC/SD card, keypad, LCD, Audio, and Modem interfaces. The recommended off-the-shelf Carrier Board for the SoM-9G20M is the SoM-150ES which allows the user to immediately start coding their application using the powerful Linux or WinCE Operating System and Tools.